The bog of despair returns! You may remember me mentioning The Bog of Despair in previous posts. It seems this annoying water-logged area is returning. I haven’t had the time as of yet to transform this area into a garden due to the endless projects at hand and I suppose it is a good thing now that this water issue seems to be increasing. Apparently, prior to 1900 this side of the street was a field. Perhaps it was farm land from a plantation that previously existed. Several blocks behind my home there once was a plantation. In fact the old plantation farm-house still stands among newer homes so it is not too far off to assume this land as part of that plantation. There were reported to be several small streams running through this area and it was a bit bog like. I think this explains the problem we have with standing water. A neighbor once said to me he was told there had been a stream that ran between our houses and it was either covered over or funneled into a pipe which travels to a larger pipe under Main Street which then is funneled into the Tar River. I am not certain if a pipe actually exists or if developers simply covered the streams and boggy area with dirt, but water is definitely concentrated in distinct areas and takes a long time to dissipate. The area I fondly call “The Bog of Despair” was leveled and covered over by the landscapers. This area still accumulates water, but it is spread out more evenly. However, lately I have been noticing a return to the depth of standing water which was present before the landscapers arrived. I assume the dirt that was added has settled and while the ground is level it is still an area where, perhaps in the past, was a stream and in this case the water will never go away completely. 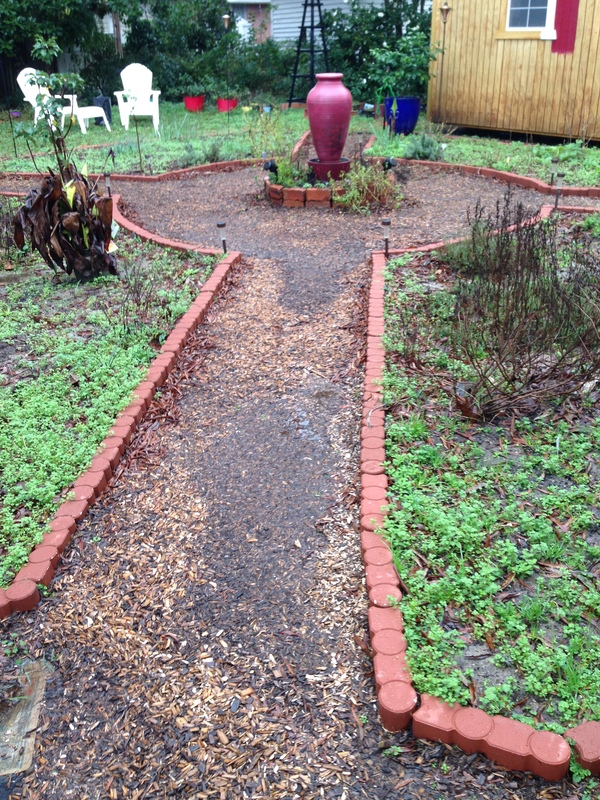 One of the walks becomes a channel of flowing water carrying away the mulch. To add to this problem since the creation of the potager its pathways has created a “funnel” effect where water is moved like a fast-moving stream to the area in front of the cottage door. It accumulates here for some time until it is pushed into the Bog of Despair area. Meanwhile much of the cypress mulch is moved with the water exposing the landscape fabric beneath. 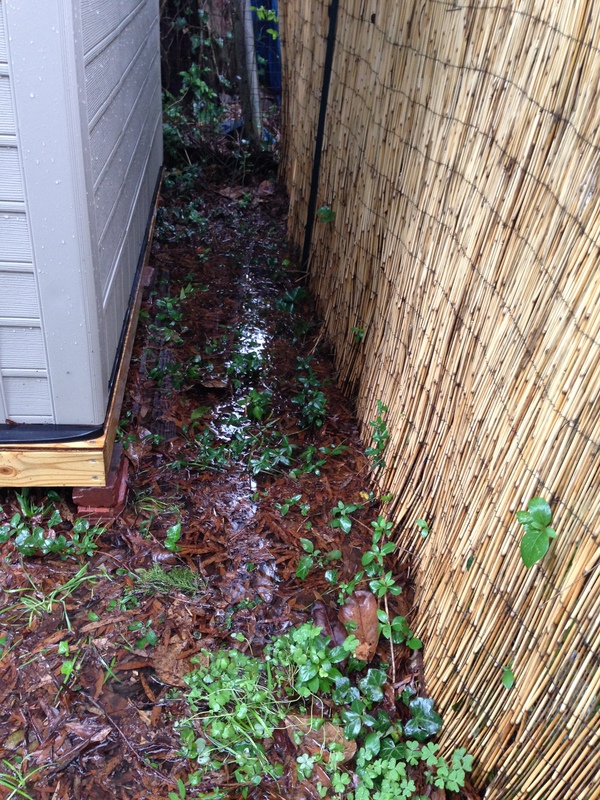 Standing water around the garden shed. I am not 100% certain what to do about this, but the only thing I can come up with is creating a rain garden in the Bog of Despair area. It will require digging a culvert so the water would be directed to it and be contained. It will be planted with water-loving plants and when it’s dry it will appear as a depression in the ground. I’ll also have to dig up the small bed in front of the cottage and connect it to the bog area via a small trench. My hope is the water that accumulates in front of the cottage door area will funnel through the trench and move on into the bog area. Oh the back-breaking work that lay ahead! Yes, a rain garden will be created! Thai giant elephant ears, Mekong giant banana trees, iris, etch. It will be lush! I just need to get there. lol Thanks for stopping by! I’m guessing when whoever did the landscaping didn’t put in any land-drains? But you would be unable to plant things on those cuts. 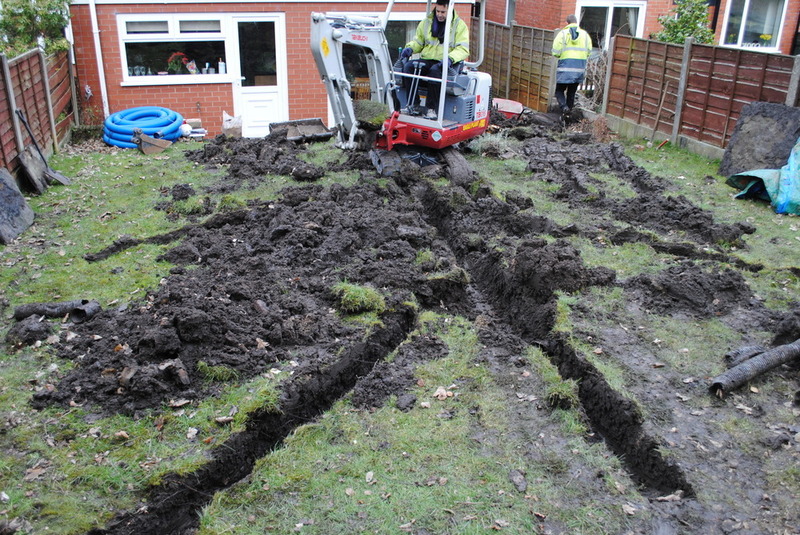 One other thing you could do is to lay some pipes just under the soil line to carry away water to a main drain elsewhere. This would stop SOME of the soil erosion you see on top.by the shed. This way means you CAN plant over them with smaller plants. The other thing to do is to plant some trees. Trees can soak up a LOT of water. No drains were added when the landscapers leveled the ground. 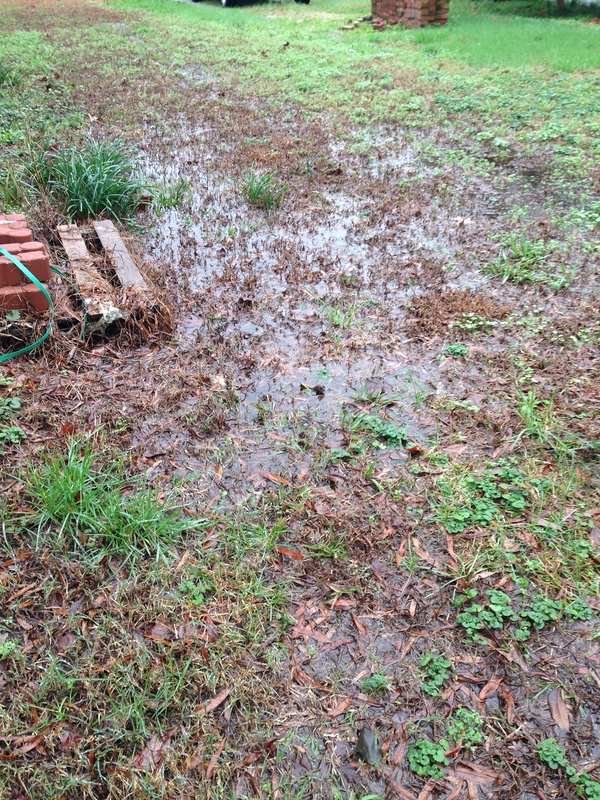 I believe the water table is low here in the coastal plain areas of NC so I know this won’t go away entirely. I do intend on planting water loving plants in the bog of despair area though. Prior to buying this home the previous owner had taken out a lot of overgrowth in the area of the “bog.” It was a mass of shrubs and stray trees. I imagine it did a lot to soak up the water, which is why I intend on creating a rain garden to hopefully drink it up. Thanks for stopping by! Yeah…I bet the trees and shrubs would have made a big difference. Is the picture you posted from your garden? Those are some rather serious trenches! Normally land drains are hidden from sight so its not so easy to get an image that shows how they work. Ah yes, this makes sense.